Greenwash is the term used to describe a product or company that has been whitewashed with unsubstantiated green credentials. It is commonly found in advertising and public relations, where corporations spend substantial amounts of money lying about their ‘green’ products, rather than actually making their products more environmentally friendly. The concept of greenwashing and the term greenwash, was coined by Jay Westerveld, an American educational environmentalist. The term was used in an essay where he described the New York Hotel industry’s practice of asking that guests reuse their towels, so as to ‘save the environment’. Sadly the hotels did not cut down on other waste or recycle in any way, leading to the conclusion that the towel signs were put up to make more profit from guests wanting to stay in a ‘green’ hotel. It is also used in advertising where products are given names that seem closer to nature or with branding that depicts forests or birds singing. For instance an airline called Nature air. Energy companies are normally the worst offenders when it comes to green washing as they are often the worst polluters. Norway has the strictest guidelines for advertising for cars in the world. Consumer Ombudsman official 1Bente Overli said: “Cars cannot do anything good for the environment except less damage than others”. The ombudsman has implemented fines for words like “green”, “clean” and “environmentally friendly” in relation to auto advertising. If the words are not dropped from campaigns, manufacturers can be charged. So far no other countries have introduced such strict guidelines. A Renault advert that would be unsuitable for Norway but is fine for the UK is shown below. This advert is very misleading due to the fact that it is branded with a ‘green’ looking logo and the word ‘eco’. 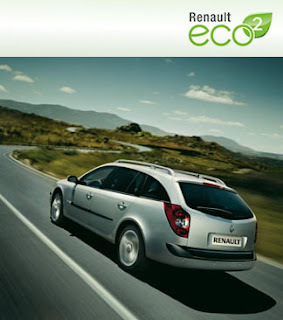 The car has lower emissions and is 95% recyclable, but it is still unacceptable to label this as an eco car. Greening of dangerous products doesn’t make them anymore safe. ‘Eco-friendly’ cigarettes anyone? Greenwash does seem harmless enough, but consumers rely on advertising to provide them with information on their purchases. This means that consumer confidence in green advertising is at an all time low. This is the problem. Actual green companies promoting green products are being tainted with the brush of greenwashing. Designers need to combat this problem as it is the one thing that could obstruct us actually moving toward a greener planet. “http://www.futerra.co.uk/downloads/Greenwash_Guide.pdf”. Futerra.co.uk – retrieved 2009 – 10 – 12. “Greenwash Watch: Norways Says Cars Neither Green Nor Clean“. Treehugger.com. Retrieved 2009-10-12. “Definition of Greenwashing“. Terrachoice.com. http://www.terrachoice.com/Home/Six%20Sins%20of%20Greenwashing. Retrieved 2009-10-12.